Have you ever been told that you need a railing to pass a safety inspection? Or you are looking for something inexpensive to provide support out in your yard for a low two step elevation change you have? Our aluminum pipe railing fittings and black pipe railings provide just the right low cost, long last solution for these areas. These railing fittings are made in the USA and sourced from Cincinnati, OH. They are customize-able to your situation. For example, put a couple of swing arms together and you have an adjustable railing elbow! Add one more swing arm and you have a “T” support that can be used to brace the center of a longer railing (shown to the right). 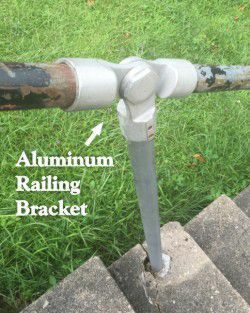 Apply a simple coat of paint over the railing and you have a protected metal that will look great and hold up to the elements of the outdoors. Stop by our Plumbing department and we will custom cut the railing pieces for your specific need. If you have a potentially unsafe situation and need the support of a simple railing, we hope that this solution will be of some help!